For Flatbread: Preheat oven to 500°F and spray large baking sheet with olive oil spray or cover with parchment paper. On a floured surface, roll out dough into a rectangle. Make sure it is nice and thin. Transfer to baking sheet before topping. Lightly brush crust with extra virgin olive oil. Sprinkle on dried basil and garlic powder to taste. Top with sun-dried tomatoes, artichoke hearts, kale, and cheeses. Place in oven and cook for 5 min. Turn baking sheet, then cook for an additional 5-7 minutes, or until the bottom of the flatbread is nice and brown. Slice into squares (I ended up with 24 squares), and drizzle with tzatziki sauce. For the Tzatziki sauce: Place all Tzatziki ingredients in food processor and pulse until smooth. 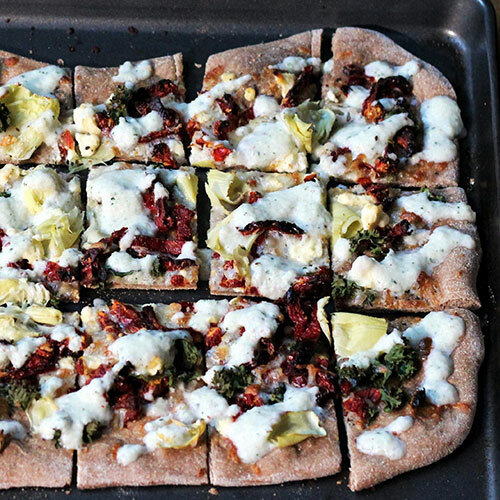 Drizzle over flatbread and store remaining sauce in the fridge for up to 1 week.